TOKYO (Bloomberg) -- Nissan said its sales may reach 10 trillion yen ($123 billion) this year depending on the strength of the Japanese yen that CEO Carlos Ghosn compared to an over-sized ape. "There is a 1,000-pound gorilla that's unpredictable, which is going to be the level of the yen," Ghosn said in an interview at the Beijing auto show on Monday. "All the Japanese car manufacturers are suffering from it, but for the rest of it, business is going very well,'' Ghosn added. While the yen has weakened the most in a basket of 10 developed-nation currencies this year, it's still about 40 percent stronger than in the months before Lehman Brothers Holdings Inc.'s 2008 bankruptcy. According to the Bloomberg Correlation-Weighted Currency Indexes, the yen is at a level of 401 today, compared with 285 in June 2008. The currency's strength continues to make exports for Japanese carmakers expensive and drives down profit margins. Overall, Japans automakers including Nissan, Toyota and Honda are expected to report higher earnings this fiscal year, according to analysts' estimates, as they restore production badly hit by natural disasters in Japan and Thailand during 2011. 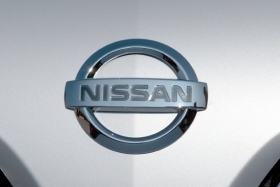 Nissan's revenue may increase 6.9 percent to 10.03 trillion yen in the year ending March 2013, according to the average of 27 analysts' estimates compiled by Bloomberg. The last time Nissan's sales reached 10 trillion yen was in the 2008 financial year. Ghosn forecast Nissan's sales to continue to outperform in China, where industry growth may range from 5 percent to 6 percent this year. In China, Nissan plans to become one of the top three automakers in the country, helped by models such as the Venucia, which is geared toward Chinese consumers looking for affordable cars, Ghosn said. The automaker plans to introduce about 30 models in the country by 2015, including electric cars, and to almost double its deliveries to more than 2.3 million units. Ghosn reiterated his targets for Nissan's premium Infiniti brand to account for 10 percent of the global luxury-car market, compared with about 2.5 percent to 3 percent today. Nissan Executive Vice President Andy Palmer, who heads the Infiniti business, said on Monday that sales of the luxury brand in China may reach 100,000 units by the end of March 2017, or 20 percent of its global deliveries. Nissan plans to begin producing two Infiniti models in China in 2014, Palmer added.